Tech Honesty, originally uploaded by chrisfreeland2002. We have no idea what we are doing today! 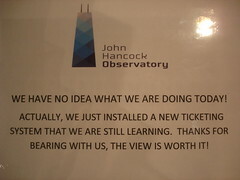 Actually, we just installed a new ticketing system that we are still learning. Thanks for bearing with us, the view is worth it! I'm not sure whether to applaud the folks who made this sign for their honesty or cringe that it was created in the first place. Why do ticketing/POS implementations so frequently stumble out of the gate? ?